Black-ish certainly has a way of evoking conversation on social media—its Season Four-opening “Juneteenth” episode is the best and most recent example of that phenomenon. After a recent conversation with its showrunners, I have a feeling this Tuesday night’s episode will do the same. Written by Peter Saji (“Juneteenth” and “Purple Rain”) and directed by Salli Richardson-Whitfield (who is scooping up these TV directing credits out here, don’t sleep! 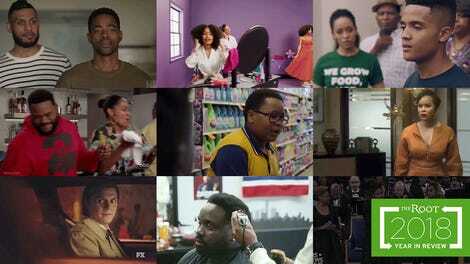 ), “Black Like Us” pops off when Dre (Anthony Anderson) and Bow (Tracee Ellis Ross) discover Diane (Marsai Martin) isn’t properly lit in her class photo. When Junior (Marcus Scribner) calls out the internal colorism in their own family, the Johnsons are faced with having a difficult yet important discussion—with levels. ABC hooked me up with a preview of “Black Like Us” and it does get heated, ya’ll. Some bubbling issues come to surface and, of course, you can always count on a historical lesson from our narrator, Dre. I also got to chat with co-showrunner Kenny Smith and Saji about the writer’s room for the episode they admittedly “procrastinated” on, for obvious reasons—it’s difficult as hell to unpack. In fact, the 20-odd minute episode only begins to scrape the surface. It’s a lot to ask of a half-hour comedy, but something that needs to be approached on a show entitled, Black-ish, nonetheless. After all, we can always keep the conversation going (with more nuance) in future episodes. The Black-ish writer’s room is quite large, thus serving as a beacon to thoroughly discuss (and sometimes even argue about) issues, given the diversity (in terms of race, gender and complexion) within. Lastly, I’ve begun a random practice where I ask all my interviewees the “blackest” experience they’ve had in connection with the project they’re promoting—and the Black-ish creative team didn’t disappoint. Smith noted that the writer or director of each episode usually rents out a food truck for the gang, and this episode’s food choice was fitting: Fried Korean BBQ wings. “It was deeee-licious,” Smith exclaimed. And yes, he said it just like that. Yes, I wish I was there. Saji’s blackest experience includes Bishop Don “Magic” Juan officiating at Dre and Bow’s vow renewal ceremony during the first season. Yes, in that moment, blackness was seen, and that’s ultimately what Saji wants. “Being able to see each other and appreciate each other was one of the biggest values for me,” concluded Saji. Watch “Black Like Us,” the 10th episode of Season Five of Black-ish, tonight (Tuesday) at 9 p.m. ET / 8 p.m. CT (and 9 p.m. PT) on ABC.